We're EXCITED to announce our return the New Edward Gallery 352-8th Ave N.E. MAY 19-28th, 2016. We are setting up to have a little fun!! On top of doing live demonstrations for folks like you, we are also hosting a Bachelorette Party for a beautiful bride to be and her closet allies. Within the 10 days we are looking to try some new glass blown shapes and vessels to test our own ability. If this is something that interested you, please come by and check out our new designs. We are also offering a variety of glass blowing classes for those of you who are keen on trying your own hand at the pipe. 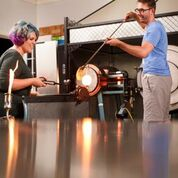 Try glass blowing for as little as $30, click here for details. We look forward to seeing you in the crowd.